The 25 metre motor yacht Lady Emma, listed for sale by Wayne Cannava at Gilman Yachts, has been sold with Joel Davidson at Outer Reef Yachts representing the buyer. Built in GRP by Taiwanese yard Kha Shing, she was delivered in 2003 as a Monte Fino 82 flybridge yacht. Accommodation is for eight guests in four cabins consisting of a main-deck master suite, a VIP suite, a double and a twin, all with entertainment centres, flatscreen televisions and en-suite bathroom facilities. In addition, three crew are accommodated in two cabins. The main deck saloon has panelling in high-gloss American cherry and comes with comfortable settees, coffee tables, a games table with seating for four and an entertainment centre including a 32-inch flatscreen television and a stereo surround sound system. Forward is a well equipped galley with a country style kitchen offering a U-shaped dinette for casual meals in front of an 18-inch flat screen television. The aft deck has port and starboard boarding gates, a fridge, full al fresco dining and entertaining facilities, and steps down to the wide swim platform where access to the engine room and crew quarters is provided through the waterproof transom door. The flybridge is enclosed and has three helm seats, a bar, fridge, four bar stools, built-in seating, two tables and full air conditioning. Twin 800hp Caterpillar diesel engines give her a cruising speed of 13 knots, topping out at 16 knots. 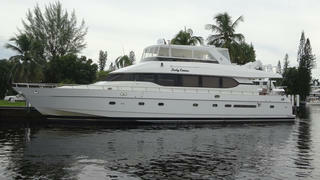 Lying in Fort Lauderdale, Florida, Lady Emma was asking $895,000.